For veterans who have military experience in commercial truck and vehicle operation, it seems natural to want to apply these skills to a civilian career. Yet to transition from a military truck driving job to a commercial truck driver has historically not been simple. Fortunately, the Federal Motor Carrier Safety Administration is changing that for military veterans. The FMCSA has recently passed the Military Licensing and State Commercial Driver’s License Reciprocity rule. Find out what this rule means for military veterans. If you have experience driving a truck for the military, you might have the skills you need to operate the vehicle. To be a commercial truck driver, you also need to get a commercial driver’s license or CDL. The most common path for getting a CDL is to attend truck driving school. Trucking school ranges from one day to two months in length, and it provides you with the skills needed to pass the CDL exams. These exams include a written test and a road skills test. Once you get your CDL, you have the option of adding endorsements for hauling passengers, hazardous materials, and tank vehicles to your license. These endorsements allow you to increase your job opportunities by picking up more specialized freight. As a military truck driver who has the experience, you want to be able to get a civilian job as soon as possible. Yet previously, military vets had to start from the basics, which is a time-consuming process that has the potential to dissuade vets from getting their CDL. At the same time, the trucking industry is in dire straits to be able to fill trucking jobs. Therefore, the FMCSA has published the Military Licensing and State Commercial Driver’s License Reciprocity rule in the Federal Register on Sept. 28, 2018. This rule allows military vets who were employed as a truck driver in the last 12 months to forgo taking the CDL skills test. This means that experienced military vet truck drivers no longer have to take the written portion of the exam. All that these drivers need to do is be able to pass the road test. If you have experience as a truck driver in the military, you should be fully equipped to operate a commercial vehicle. As such, you will only have to take the driving test to be able to get your CDL. You can avoid going to trucking school in order to get your CDL as a veteran, which saves you time and money on getting your civilian job going. In addition, the FMCSA rule states that military veterans who have proven experience in similar skills, such as transporting hazardous materials or tanker loads, can also be exempt from these exams. 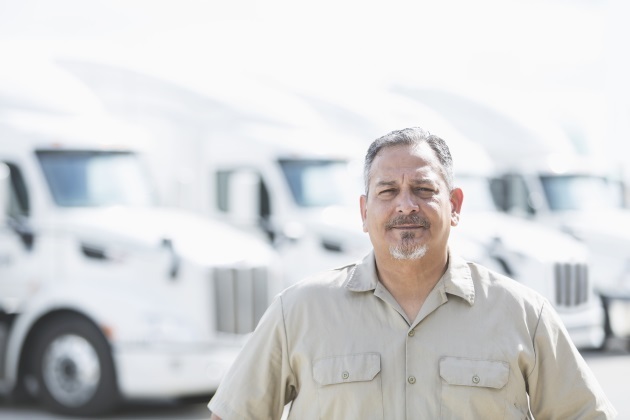 While the endorsements are not mandatory for commercial truck drivers, they do enhance a driver’s CDL and work history for potential employers. Along with the fact that you must have applicable experience within the last year, take note of a few highlights from the ruling. The FMCSA had already provided the skills text exemption for military drivers back in 2011. However, the old rule was that vets had to have at least two years of safe driving experience in service. The new ruling cuts that required time in half. Therefore, if you did not qualify for the waiver exemption prior, you may be eligible now. Also, military veteran truck drivers must be able to pass the vision, hearing, and certified medical examiner physical exam in order to qualify to be a commercial driver. There are exemption waivers for the vision and hearing portions of the exam. In addition, certain physical issues, such a high blood pressure or diabetes, that are manageable do not automatically disqualify you from a truck driving career. In other words, it is becoming easier than ever for veterans to get trucking jobs when they return to civilian life. After earning her MS in Sociology and Anthropology, Miranda worked in manufacturing, logistics, and as a librarian before admitting to herself that all she really wanted to be was a professional writer. Since 2008, she has written more than 4 million words. As a professional writer with a family history of military service members, Miranda Brumbaugh takes pride in being able to provide content for the military community. When she is not writing about the latest military news, she is working hard as a trucking content writer.